What Is Done during a Brake Fluid Flush? Your brakes are one of the most important components of your car. If they don’t work like they should, then your next drive could end in tragedy. It is essential that you take good care of your brakes and that they receive regular maintenance. A brake fluid flush is similar to an oil change in that it gets rid of a lot of the contaminants that can clog up your fluid and hinder the way your vehicle’s components work. A brake fluid change costs between $73 and $104 for the majority of vehicles. The cost of labor will make up the vast majority of the cost, with the brake fluid itself relatively inexpensive. The cost is largely the same no matter what make and model of car you drive as it’s a fairly straightforward repair. Below are some sample costs for a brake fluid flush some the leading auto repair companies in the country. Most local garages should be able to provide this service and it may be done as part of your annual tune up. Costs should be taken as a rough guide only, as prices will vary from place to place. Over time, your brakes are going to wear down and not work like they should. Some of this is due to natural wear and tear or because of overstressing on your brakes. But sometimes, brake malfunctions are caused by contaminants inside the brake fluid. You may find air, dirt, moisture or grime in the brake fluid when it is time for it to get flushed out. All of these hamper the proper operation of the brakes in their own way. The most common effect is that the brakes will become squishy or not quite as responsive as they should be. This means you will brake slower and have less control over when and where you vehicle stops. That’s bad news for anyone in the vehicle or on the road around you. As your brakes become less and less responsive, your vehicle will become more dangerous. Changing out your brake fluid doesn’t just make your vehicle safer. It also ensures that your braking components such as the drums and calipers last longer. Old fluid that is full of contaminants will wear out your brake components much faster than fresh, clean fluid. Changing the fluid out regularly means that your vehicle will last longer, perform better and cost you less to maintain. Even if you balk at the cost of this procedure, keep in mind that it will cost you much more to repair damage done by not replacing the fluid in a timely manner. There isn’t a set period of time in which you need to make sure your brakes are flushed. The way you use your brakes will often determine how soon the fluid needs to be changed out. The more you use them, the more often you will need to flush them out. The kind of fluid you use and the age of your brake components will play an important role in the time as well. Low quality fluid will need to be replaced more often, and if your brakes are old, they may start shedding parts into the brake fluid, requiring more frequent replacement as well. While we compared brake fluid flushing to oil changes earlier, this service doesn’t need to be done as often. You can change the fluid out every three years or about every 24,000 miles, whichever comes first. When you do get your fluid flushed, be sure you are using the right kind of brake fluid. Some cars require silicon-based brake fluid while others use regular braking fluid. First, the contaminated brake fluid is taken out completely. Then new brake fluid is placed inside. The brakes are then bled. This is to get rid of the squishy feeling some brakes can have when there is too much air inside them. The air is pumped out of the brakes through a hose until no air is left inside. Sometimes, the mechanic will use a powerful vacuum instead. The vacuum is hand-held, and it is often used when the mechanic has to come to you. It works nearly as well as the pressure bleeder that is most often used, so you don’t have to worry about the quality of the process being sacrificed. The bleeding process can be a bit messy, and it may make some brake fluid spill out onto the brakes. The technicians will clean this up then start looking for fluid leaks. 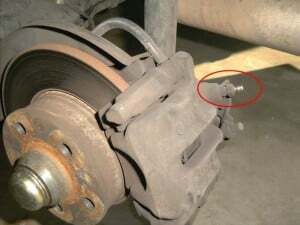 They will usually look at the parts of the brake and inspect them for defects. They should examine the brake rotors, brake pads and brake hoses. If they find any problems, they may report them to you or just opt to fix them right then and there. Once they are sure nothing is visibly wrong with the brakes, they will test drive the car and ensure the brakes are working like they should. If they find a problem, they will re-inspect the brakes until they locate it. Brake Fluid flushing is considered a low cost maintenance service. But it could still be more than you want to pay. While you can shop around for a cheaper price, the cost isn’t likely to vary much. To really save money, you can do the brake fluid flush on your own. It’s not a complicated process, and there are plenty of instructional videos out there to help you through it. You just need to make sure you have the right tools and that you don’t accidentally damage your brakes or your vehicle. If you have some experience in doing basic auto repair and maintenance, then performing a brake fluid flush on your own should not be a big deal. Having your brakes flushed will generally be the same price no matter what you drive. The main difference will be in the cost of the brake fluid from the manufacturer, and this will vary depending on the type of brake fluid used. Labor costs should be roughly the same for every car.